Last night, GIPHY — the five-year-old database and search engine for GIFs — hosted the inaugural GIPHY Film Festival in New York City in a bid to celebrate short-form content creators and video works no longer than 18 seconds. The event was emceed by actor/writers John Early (30 Rock) and Kate Bernet, and the evening’s biggest winner was Ani Acopian (pictured above) — a self-proclaimed “visual storyteller” — who took home the Grand Prize for her GIF titled Washed Up (see below). The stunning 14-second film is set in Iceland and was created alongside fellow artist Cody Guilfoyle. Shot from overhead, Washed Up sees Guilfoyle laying on the beach as waves gently crash over his body. “Video doesn’t need to be long to get across an emotion, concept or story,” Acopian — who has also been recognized by The Shorty Awards and the Tribeca Film Festival — said in a statement. 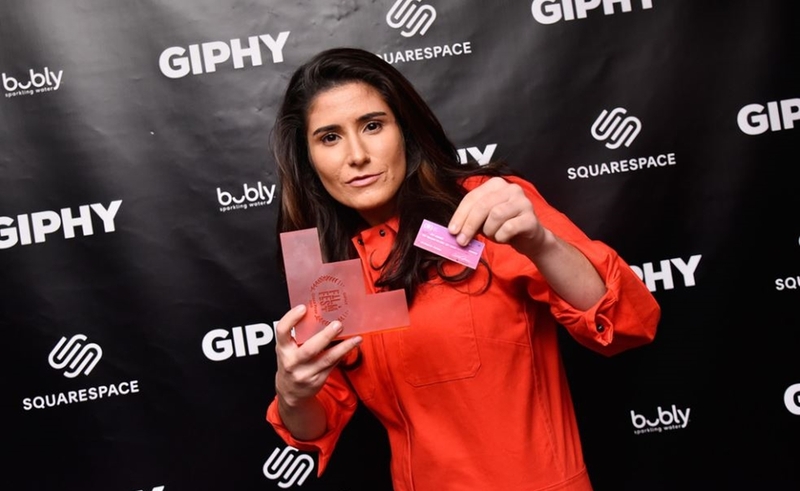 “I’m excited GIPHY wanted to do something to celebrate that.” Acopian’s Grand Prize winnings included a cash prize of $10,000 and a five-year website subscription from Squarespace, which sponsored the event. Other awards were handed out in a total of five categories last night, including ‘stop-motion’, ‘animated’, ‘experimental’, ‘narrative’, and ‘other’. Winners were selected by a panel of judges that included esteemed vlogger and filmmaker Casey Niestat as well as Spotify’s global creative director, Alex Bodman. Influencers in attendance at the event included Clifford Owusu, D’ana Nunez, McArthur Joseph, and Steffi Lynn. At the same time that it celebrated accomplishments in the GIF space, GIPHY also announced the soft launch of a new video platform — meaning that in addition to hosting GIFs, the site will now serve as a hub for traditional videos as well. Initially, the platform will be available at giphy.com/filmfest and host hundreds of the submitted works from the Film Festival. Eventually, the video hub will allow videos under 30 seconds. All told, GIPHY says that it serves 5 billion GIFs every day to more than 300 million daily active users.